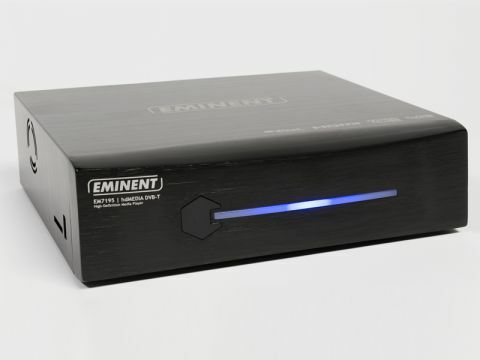 Eminent is one of a handful of media player manufacturers prone to throwing TV recording into the mix. Its EM7095 combined an (SD only) digital terrestrial PVR with an HD-capable media player, although its recording component was basic and it lacked networking support. The EM7195 promises improved functionality in the form of two tuners (again suitable for reception of standard-definition Freeview channels only) and built-in networking (you'll need to add a dongle for WiFi) with support for Samba, DLNA and uPnP and torrent downloading all powered by a new Realtek chipset. Looking like a NAS drive, its black and bulky form lacks a readout, just a power light stretched across the middle of the fascia, glowing red in standby or blue when in operation. The fan is a little noisy. It will take 3.5-inch SATA drives inserted via a slot beneath a flap on the right-hand side and is being sold in some quarters with drives pre-installed ranging from 500GB (£220) to 2TB (£289). You can also use USB-connected or external SATA-connected drives, insert memory cards into the slot provided on the left side next to a USB 2.0 port or stream from networked storage. There are plenty of connections on the rear including a USB 3.0 port (client only) two more USB 2.0 host ports, HDMI, component and composite video outputs for video and coaxial and optical S/PDIF and stereo phono outputs for audio plus SATA and LAN connectors. There's also an aerial loopthrough – although it uses F-connectors, which could mean an adapter is needed – and a power switch. Most key cables are provided. The shiny remote control is better than many we've seen with similar products sporting PVR controls and a few menu shortcut buttons. It can also be backlit, which makes TV and film viewing with the lights dimmed easier. A side-scrolling interface with labelled icons is clearly influenced by Sony's Xross media bar, and familiarity largely breeds contentment. One exception is the web browser. Here you get a favourites option but entering addresses is hamstrung by the browser bizarrely not being covered in the manual, leaving us to guess which keys on the remote do what. You can record two TV channels at once (to internal or USB drives) using a manual timer or by pressing record when watching TV and timeshift as you go. A basic EPG which supports seven-day DVB data and displays a list of shows for one channel at a time viewable day by day. Red button services aren't supported. Recordings are in native MPEG-2 format and can be exported to storage devices. They can be fast-forwarded and rewound up to 32x speed and picture quality is reasonably sharp for SD (certainly an improvement on the lacklustre EM7095). Music, video and photo playback and web-enabled functionality get their own menus. Format support is broad, including MKV, and ISO files as well as AVI, XVID and MP3 – it played the myriad formats stored on our NAS drive, albeit with minor jerkiness evident on some DivX Plus HD files. Subtitles are supported and playlists can be imported or set up within the software. Web services include YouTube, Flickr, Picasa, Shoutcast internet radio, BBC News and Metafeeds, all reasonably easy to navigate with the remote. DVB-T2/Freeview HD reception is a predictable omission in a Euro-minded product, but this is undoubtedly an improvement on the EM7095. We hope some of its drawbacks can be remedied when a promising looking replacement interface is eventually released.